Dinner deals from more than 10 different restaurants and three different ice cream shops. I’ve subscribed to the promotional emails of 500 companies and brands so you don’t have to. I sift through 1,000 deal-touting emails every week. Most are worthless, but a handful offer valuable coupons, promo codes, sales, and freebies – which I collect and organize for you here. Bruster’s Real Ice Cream: $2 off a 6-pack of ice cream sandwiches (print first) [3/31]. Bruster’s has locations in 21 states. Ben & Jerry’s: Free scoop of any flavor ice cream between noon and 8 p.m. on Free Cone Day [4/3 only]. Ben & Jerry’s has locations in 35 continental states plus Hawaii, D.C., Puerto Rico, Ontario, and Quebec. Maggie Moo’s Ice Cream and Treatery: $3 off an 8-inch or sheet-size yogurt cake (print first) [4/30]. Maggie Moo’s Ice Cream and Treatery: $2 off a 6-pack of yogurt cupcakes (print first) [4/30]. Bob Evans: 10 percent off a holiday feast, which serves 12 to 15 people and gets delivered to your door [4/3]. Bob Evans: Free breakfast with the purchase of one breakfast (print first) [4/7]. Note that this coupon is not valid on Sundays. Boston’s The Gourmet Pizza Restaurant & Sports Bar: $10 off a $40-plus purchase (print first) [4/14]. Boston’s has locations in 23 states. Captain D’s Seafood Kitchen: Full meal deals are $5 [expiration unknown]. They come with two sides and hush puppies. Captain D’s has locations in 26 states. Chili’s Grill & Bar: Their new lunch combos start at $6 [expiration unknown]. They have also added a Lunch Reward Card promotion, which gives you a free lunch combo after you’ve purchased nine of them. Hot Dog on a Stick: Free lemonade with any purchase if you show a Hunger Games movie stub from the same day [expiration unknown]. 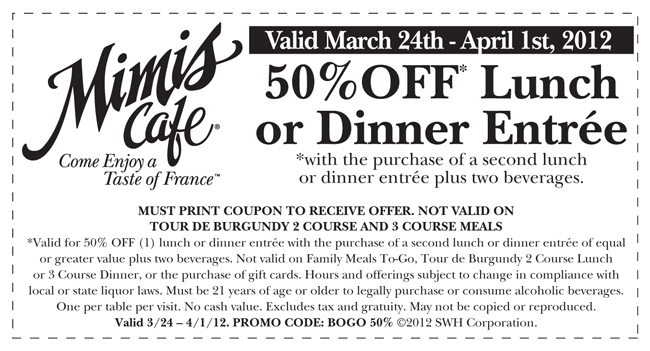 Mimi’s Cafe: 50 percent off a lunch or dinner entree with the purchase of one entree and two drinks (print first) [4/1]. Papa Murphy’s Pizza: $2 off a full-priced pizza (print first) [3/31]. Ruby Tuesday: They now have $5 Absolut cocktails and $5 appetizers during Happy Hour [expiration unknown]. They don’t say what the happy hour hours are, though, so ask your local restaurant. Tony Roma’s: 50 percent off ribs: St. Louis ribs or baby back ribs, half or full (print first) [4/3 only]. Waffle House: Free hashbrowns when you dine in (print first) [3/31]. Looking for grocery coupons? Check the “Food” section of our deals page.